Judith Hereford was born in NZ umpteen years ago, the second child in a family of five boys. She trained as a nurse before coming to England in the early 60s on a working holiday. After extensive travelling in the UK, Ireland, Europe. and what was then communist Russia, interspersed with private nursing and eighteen months at the Churchill hospital in Oxford she returned to NZ to join the Army. The RNZNC is tri service providing experience in the Army, Navy and Airforce. This included a year in Malaysia, a stint in the Navy and a spell with 40 SQR where she collected wounded soldiers from Vietnam, accompanied civilians to and from Rarotonga and made two trips round the world, all on C130 Hercules aircraft. 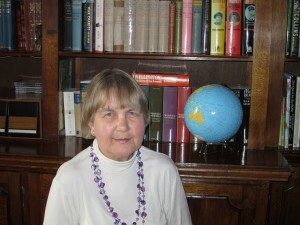 Judith met her husband while serving in Malaysia and returned to England as an Army wife. A son was born in each of the two overseas postings of Mauritius and Germany and in 1979 husband James retired from the Army and they moved to Herefordshire to the family farm where they have been ever since. There she became involved with politics in a voluntary capacity and with Arthritis Research for many years. She also served on the Committee of Hampton House Residential Home where she is now Chairman.